Let's take lake Saint-Cassien as an example. You can make out the real pegs indicated by markers: green for a post that is free, red for a peg that is in use and white for a peg that is closed. The number of the peg appears in the centre of the marker. The pegs offered by CarpCup are not chosen at random and stick as far as possible to the carp fishing realities of the venue. 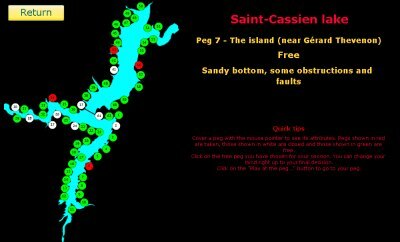 So, for lake Saint-Cassien, it really is the pegs known to everyone that are offered, whether they are marked as such or not. The attributes of a peg appear as you move the mouse over the marker indicating the peg. The attributes of the peg are displayed in yellow in the peg information area situated to the right for the Saint-Cassien venue. The first line shows the number of the peg and its name if it has one. The second line shows its status (free, taken, closed, chosen) with the nickname of its user if it is taken. The third line gives a description of the characteristics of the peg to guide you in your choice. Finally, the last two lines display the results of the last sessions held on this peg. To choose your peg, click on the peg marker associated with the one you want which then changes to orange. The button "Play at peg 9" appears. Click on this button to carry out your fishing session at this peg. If in the end you choose peg 55 instead of 9, click on the marker for peg 55. And so on all the time you are making up your mind. But you are not alone in wanting to take part in this enduro and another player may also choose the same peg as you. It is the first to press the "Play at peg ..." button who will get the peg. Finally, you will see the peg markers continually changing colour as the fishing sessions proceed because the game is realtime and multi-players.